Known largely as a pop artist and painter, Robert Rauschenberg was originally a photographer, an art form he would later return to, capturing in his unique way the oddities of everyday life. Stimulated by a commission to design a stage set for the dancer Trisha Brown, he returned to photography to capture new images as source material for the work. Using similar collage techniques to his paintings, Rauschenberg forms his compositions through the lens rather than in the darkroom, preferring the adventure of waiting until the photographic frame is full of the right ingredients; light, shadow, form and truth.1 Believing that perfection is death, Rauschenberg re-creates a sensation, an instant in which the photograph can comprise moments and things unseen by the naked eye, resulting in truth with a little chance thrown in. ‘No 4 Los Angeles’ and ‘No 5 New York City’ 1980 (AGNSW collection) reflect Rauschenberg’s anomalous approach to the image that acquires ‘a presence due to a lack of literal reference and in some cases the aggressive absence of internal information’.2 Like moments from a Jacques Tati film, these images are reflections of Rauschenberg’s meanderings through the streets of Los Angeles and New York, shooting whatever captures his imagination and eye. Shot in the middle of the day, the bicycle, a vehicle of speed and high manoeuvrability, is instead at rest. He has chosen to photograph the bike as fractured; its front half missing with no means to direct itself, the only hint of its desire for speed being in the sharp angle of its shadow. The close shot of a water fountain in ‘No 4 Los Angeles’ reveals the chance of redemption in the drinking of the chilled holy water. 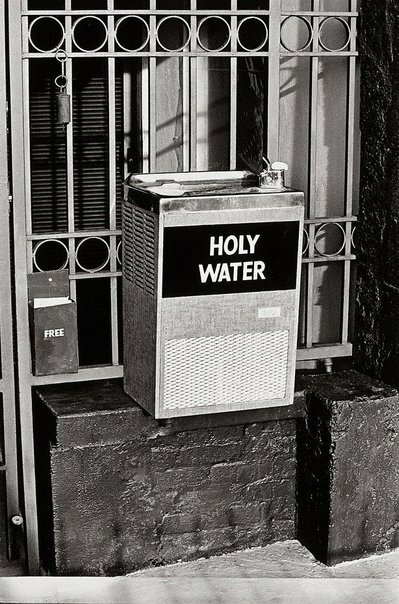 The interplay of shapes and strange objects reveals his interest in the odd juxtapositions of life, such as the sign ‘Holy Water’ and the sign ‘Free’ offering religious tracts to the lost, and the bell from which the call for salvation can be made. Each component forms a collage of information so familiar in his paintings. Signed l.r., ink "Rauschenberg". Dated l.l., ink "11-81...". Donna Brett, Photography: Art Gallery of New South Wales Collection , 'A postwar modernist vision', pg.209-225, Sydney, 2007, 222 (illus. ).